Following on from the most recent post that featured a day’s shooting with a new to me fisheye zoom lens (see Fun with a fisheye), this next post will share a few images I’ve subsequently taken with this lens back in my home town of Adelaide. Firstly, a quick recap for those who have not read the Fun with a fisheye post: I recently acquired a secondhand Pentax DA10-17mm fisheye zoom and set out to discover what sort of images I could make with the ultra-wide angle views this lens can deliver. The Fun with a fisheye post shared images of my first day with the DA 10-17, a day which happened to find me over in Sydney. 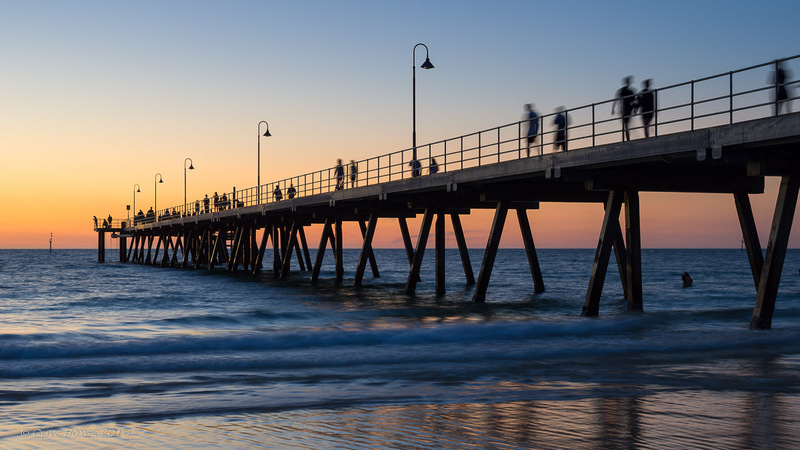 Back in Adelaide, I have since made a couple of trips down to the beachside suburb of Glenelg, a location I often head to when trying out new photo equipment. So, without further ado, over to some evening images of Glenelg. A replica of HMS Buffalo – the original was wrecked off the North Island of New Zealand. 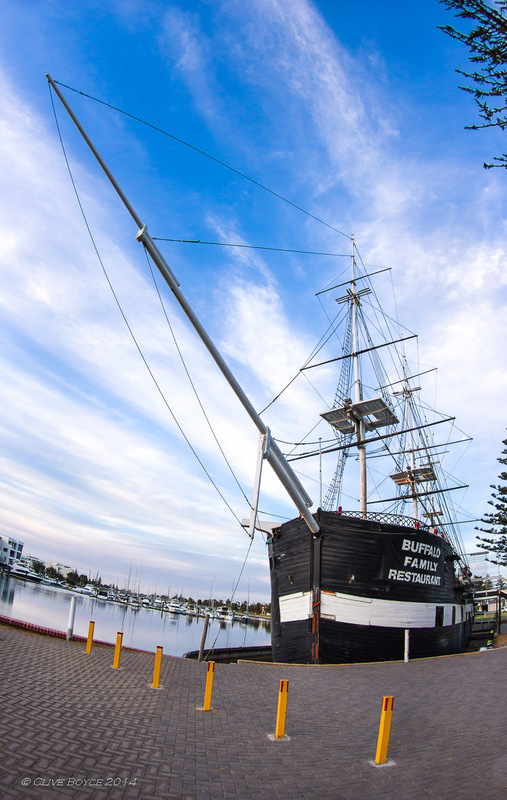 The Buffalo brought the first settlers of the colony of South Australia in 1836, unloading its passengers at what became known as Glenelg. Photo-wise, a near 180º view towards the wide end of the lens can take a little getting used to. The tip of the bowsprit was over the top of my head and marginally behind me. Weird! Lots of green chromatic aberration in the upper right corner around the tree branches. This seems to be a bit of an issue down at the zoom’s wider focal lengths (this was taken at 11mm) with high contrast detail in the corners. If I had lots of time, the best thing for this particular image would be to clone out the tree branches altogether in Photoshop or similar software. I really didn’t want them in the image and were a by-product of wanting a field of view wide enough to take in the bowsprit. It was also one of those really flat and contrast-less evenings that was hard work to get much out of. I’ll have another go at this scene one day when there is better light. This entry was posted in Adelaide, Places to Visit and tagged Fisheye lens, Glenelg, Pentax DA 10-17 zoom, Photography, Wide Angle Photography on March 9, 2014 by aussiesouthlander.